When Google announced its first Nexus 7 tablet, built by ASUS, back in mid-2012, it was clearly destined to make the budget tablet market skyrocket. For a very low $199 price tag, the Nexus 7 offered excellent performance, good built quality, and virtually immediate Android updates. It was a cost-performance paradise, so unsurprisingly it quickly became extremely popular. Now, one year later, when the OG Nexus 7 is growing long in the teeth, Google and ASUS took cost-performance to a whole new level again with the new Nexus 7. The refreshed 7-incher offers one of the fastest processors and a 1080p display, while keeping a very slim profile and record-breaking weight, all for just $30 more. Of course, competitors are in a catch-up state, but for now, the new Nexus 7 is clearly and by far the best budget tablet, and is also certainly the best cost-performance tablet ever made. The new Nexus 7 isn't radically different from the old iteration, but the differences are notable and much appreciated. The back design gets a makeover, since it changes the textured rubbery back of the OG Nexus 7 for a plain, still a bit rubbery plastic, resembling the Nexus 10's feel, which makes the back look cleaner. Strangely, Google didn't make it clear whether they wanted the new Nexus 7 to be used more in landscape or in portrait mode. The vast majority of smaller tablets, including the 2012 Nexus 7, are tailored for use in portrait mode, but the new Nexus 7 gives some indication of wanting to be used in landscape. For instance, the Nexus logo on the back is oriented in landscape (but the smaller ASUS logo beneath it is in portrait.....hmmm weird), and the stereo speakers are both positioned on the tablet's top and bottom sides (when in portrait). Apart from that, the back contains the 5 MP shooter at the top left corner. Aside from that orientation shortcoming, the back of the new Nexus 7 does look significantly more premium than its older counterpart. The front of the device is very similar to the OG Nexus 7, with the exception the the vertical bezels are slightly thinner, and there is now a notification LED below the display. The tablet's dimensions are impressive for a device with its price, and indeed, the new Nexus 7 does feel much thinner and lighter than its older version. The thickness comes in at 8.7mm; not as thin as the iPad mini (7.2mm), but still a significant improvement over the OG Nexus 7's 10.4mm girth. Impressively, the new Nexus 7 sets the record as the lightest tablet ever, weighing just 290g (299g for the LTE version), it's lighter than the iPad mini (308g, 312g with LTE) and much lighter than its predecessor (340g, 347g with 3G). 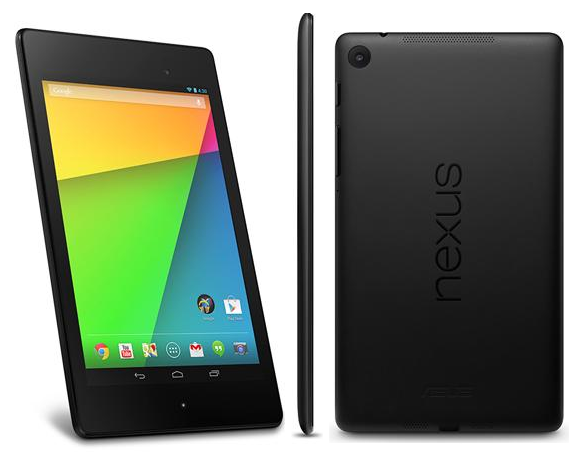 Especially for its price, the new Nexus 7 is one very svelte device. People have been wondering how long it would take for Apple to release a Retina iPad mini. Well, Google beat them to it. The new Nexus 7's display has a pixel density that sits squarely in the Retina range, and is actually the tablet with the highest ppi ever. 1920 x 1200 pixels in that 7" IPS display results in an extremely crisp 323ppi pixel density. It blows the iPad mini's mediocre 163ppi and the OG Nexus 7's 216ppi out of the water, displaying razor sharp text and bright, crisp images. The LED-Backlit IPS technology also means that the new Nexus 7 will have excellent viewing angles and vivid color reproduction. There's no question about it; the new Nexus 7 has by far the best display in the 7/8-inch tablet market, and quite possibly the best display in the entire tablet space. Guess what? Google also gave performance a huge upgrade with the new Nexus 7. The refreshed 7-incher doesn't have a particularly new SoC, but it's definitely one of the fastest. The SoC in question is Qualcomm's Snapdragon S4 Pro SoC, which consists of a very fast Quad-core Krait CPU clocked at 1.5GHz and a very juicy Adreno 320 GPU. With that kind of performance, the new Nexus 7 will definitely be one of the fastest tablets in existence, and will be quite the gaming machine, especially with the crisp, bright display. I may be wrong, but from my point of view, there is absolutely nothing to complain about the new Nexus 7. As it's a Nexus device, it will be the first to receive Android OS updates for many years to come. It offers an improved build quality with better looks, it's much lighter and thinner, placing itself as the lightest tablet ever. It has an outstanding display, probably the best display ever seen in a tablet, and it's performance is excellent, making it a good gaming machine. I may be getting ahead of myself here, but the new Nexus 7 is basically one of the, if not the, best tablet ever made. And to make it almost perfect, it's also very budget friendly. It's a bit more expensive than the OG Nexus 7, but it's still significantly cheaper than the much more lackluster iPad mini. Starting at $229 for the Wi-Fi only version with 16 GB (pricing for the LTE version is still unknown), the Nexus 7 is the bargain of the century. Well done, ASUS and Google!